Three Metro Blue Line stations–Grand/LATTC, San Pedro Street and Washington Station–will close this Friday evening and Saturday for upgrade work. Crews will install new station canopies, paint, tile and audio/visual enhancements. Improvements are slated to take three weeks, so Blue Line customers should anticipate two additional weekends of the same closure on June 5-7 and 12-14. Here’s what to expect while station closures are in effect: This Friday after 9 p.m. through Saturday, close of service, bus shuttles will replace Blue Line trains between 23rd/LATTC/Ortho Inst and Vernon Station. There will be no Blue Line trains between 7th Street/Metro Center and Vernon, which means Blue Line customers must take the Expo Line to travel between 7th St/Metro Center and 23rd/LATTC/Ortho Inst, where they can connect to bus shuttles serving Grand/LATTC, San Pedro St, Washington and Vernon Station. Express bus shuttles will be in place for customers requiring direct travel between 23rd/LATTC/Ortho Inst and Vernon, in addition to the regular “local” bus shuttles that will serve each station between Grand/LATTC and Vernon. Trains originating in Downtown Long Beach Station will travel only as far north as Vernon Station. On Friday evening, May 29, the last complete trip from Long Beach to 7th St/Metro Center will depart Downtown Long Beach Station at approximately 8:02 p.m. The last train from Downtown L.A. to Long Beach will leave 7th St/Metro Center at approximately 8:45 p.m. For some customers, using a combination of the Metro Green and Silver Lines may make for a faster route between Downtown L.A. and South L.A./Long Beach. This Friday after 8 p.m., Blue Line will run every 12 minutes between Vernon and Downtown Long Beach Station. Expo Line will operate every 10 minutes until close, beginning at approximately 8 p.m.
On Saturday, Blue Line trains will again run every 12 minutes between Vernon and Downtown Long Beach Station, and Expo Line trains will arrive every 10 minutes throughout the day. As many are already aware, adjustments to Blue Line service this year have been, and will continue to be, necessary for the completion of the Blue Line Upgrades project, a $1.2-billion overhaul including station improvements, track replacement/refurbishment, and even, eventually, new rail cars. Upgrades are already complete at stations between Florence and the Long Beach Loop, and will continue to move north along the Blue Line throughout 2015. The estimated wrap-up date for the entire project is late summer. That being said, Metro recognizes that these service changes can be, simply put, a pain, and would like to say thank you to all affected customers. The end goal to keep in mind is a safer, more reliable and updated Metro Blue Line for years to come. Please check back here at The Source, or follow us @metrolosangeles or@metrolaalerts for the latest Blue Line service updates. That 23rd/LATTC/Ortho Institute name is so, so convoluted. Just 23rd street was a good name. I know for sure barely anyone knows where the Ortho Institute is! Why did the shuttle go to 23rd St, which is not a normal Blue Line stop? 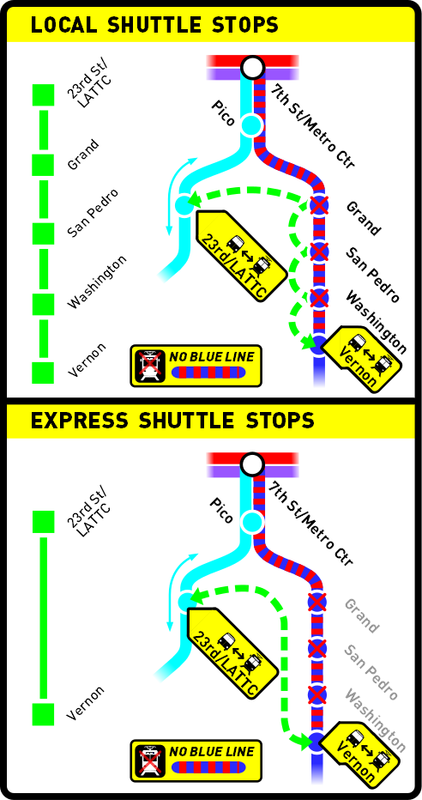 Bus shuttles typically just bypass a non-operative rail segment, but given that the segment here was so close to the end of the line, I think it would have made sense for the shuttle to also stop at Pico and 7th/Metro Center, eliminating the need for an extra transfer to the Expo Line.